This entry was posted in Uncategorized and tagged alienation, chaos, Consciousness, creativity, culture, ego, language, mankind, matter, McKenna quotes, meditate, mystery, nature, philosophy, ponder, psyche, psychedelic, real, shaman, society, stigma, Terence McKenna, think, TV. Bookmark the permalink. 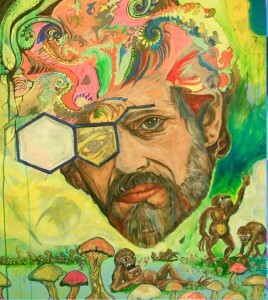 Love Terrence McKenna! He was one intense dude. Yes, unfortunately, street drugs are not safe. I took LSD in my early twenties, less than ten times. Mushrooms (very good quality) twice and some assorted other drugs. I was lucky. Every trip was different because of the impurity issue. I might consider taking DMT, but don’t feel any urgency to do that now. Thanks David! I love how you say that :) I like to think I am doing my part there, lol! I am really fascinated by research I read about using the psychodelic Ibogaine in the treatment of heroin and other drug addiction and alcoholism – conditions for which no effective treatment exists in western medicine. Unlike the US, the drug is legal in NZ though doctors who prescribe it have to notify the government. It also seems to be really helpful in symptom improvement in terminal illness. At present, the global elite seems determined to exert absolute control over every aspect of our lives. The extent of the control is so extreme that nearly all of us are denied the opportunity to experience our full human potential. Mr. McKenna surely had a way of zeroing in. What a mystery he points to when he says “the cost of sanity, in this society, is a certain level of alienation”. What a tradeoff. Great quotes. Thanks. He was a great thinker Jerry, thanks for commenting.